Last week Anheuser-Busch InBev (BUD) reported another disappointing set of earnings results. The main headline for income investors was unfortunately a 50% dividend cut, which helped send the stock down 9% on the news. Having looked at AB InBev about a month ago, the company seemed to deserve its "Borderline Safe" Dividend Safety Score of 50. A dividend cut appeared possible, but not necessarily probable. 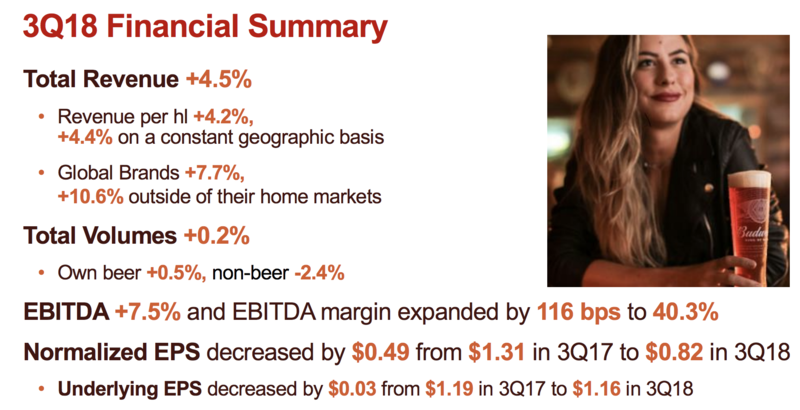 Considering AB InBev's stable operations, continued EBITDA growth, strong credit rating, expected improvement in second-half cash flow generation, multiple levers to free up additional cash (divestitures, scrip dividend, etc. ), and management's commitment to continuing the firm's existing capital allocation framework, the dividend appears to remain secure for now. However, management needs to do its part to execute. The firm's U.S. operations need to eventually improve, SABMiller synergies need to be delivered, and AB InBev's balance sheet needs to become safer. There's time to achieve success in these areas, but there is not much margin for error if any unwanted surprises crop up...conservative income investors looking for fewer headaches and more predictability may want to look elsewhere." As AB InBev's major beer brands continued to (slowly) lose market share in the U.S. and currency volatility weighed on the firm's profits, management changed their tune and decided to speed up debt repayments. Cutting the dividend by 50% will free up close to $4 billion in cash that can go towards those efforts. AB InBev's dividend cut involved some discretion since the firm's free cash flow more than covered its dividend, and overall sales, EBITDA, and profit margins were actually improving. And unlike most companies that ultimately reduce their payouts, the beverage maker was not facing any liquidity issues, even despite currency volatility in emerging markets. During the firm's conference call, management was asked why they settled on a 50% dividend cut. They noted that AB InBev has about $11 billion of debt maturities from 2018 through 2020, which is more than covered by the firm's $17 billion of liquidity. "From the liquidity standpoint, there is no pressure whatsoever," management exclaimed. Furthermore, AB InBev explained how its debt maturities were nicely balanced with a 12-year average duration and no concentration in any year. Once again, the firm explained refinancing risk as "no big issue." Management even mentioned the possibility of no dividend cut since their was no liquidity constraint, but they desired to strike more of a balance between speeding up debt repayments and the dividend. These situations are rather unusual and can be hard to evaluate. On paper, the dividend seemed like it could have been sustained. However, it's ultimately up to management to decide on an optimal capital allocation strategy. In AB InBev's case, that meant taking action to accelerate the deleveraging process. The company's U.S. business has been struggling for several years as consumers increasingly opt for spirits, wine, and craft beers instead of Budweiser. 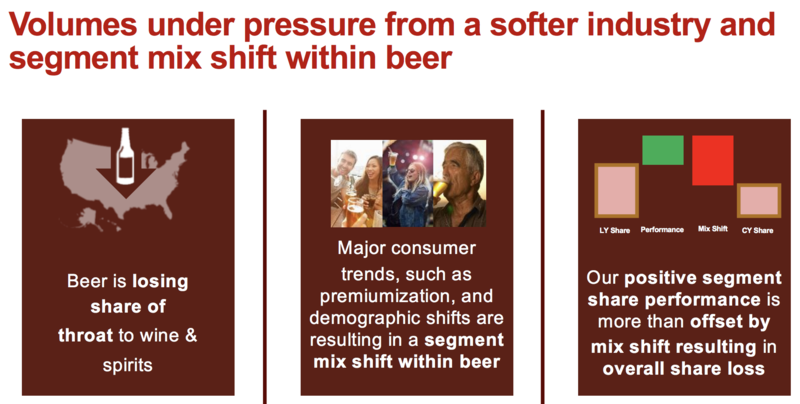 With that said, AB InBev's U.S. business is hardly a disaster and should remain a cash cow for years to come. Revenue grew 1.5%, and the company still maintains an EBITDA margin north of 40% in that region. When massive businesses like AB InBev feel a need to realign their product portfolios, acquisitions of on-trend companies are a common remedy to pursue. AB InBev is no stranger to this path, having bought up a number of craft brewers in recent years. Despite cutting its dividend, the company acknowledged that it intends to continue making deals to build out its offerings in growing beverage segments. Reducing the dividend to improve its balance sheet at a faster pace means AB InBev will be ready to hunt for its next big deal sooner rather than later. For existing shareholders, AB InBev's dividend yield will fall to about 2.2%, which may be insufficient for investors looking to live off dividends. However, a lot of bad news is baked into BUD's stock price, and the business still has a number of appealing qualities: non-cyclical cash flow, 70% of volume in emerging markets, 27% share of the global market, excellent profitability with an operating margin north of 30%, moderate long-term growth potential, and an improving balance sheet. AB InBev's profile could be interesting for long-term investors since there doesn't appear to be as much downside risk with this turnaround situation compared to many others. From a Dividend Safety Score perspective, while we already ding most types of companies for operating with high debt loads, it may be worth being even more conservative in cases where the high leverage results from a major acquisition (in 2016 AB InBev bought SABMiller for over $100 billion). In these situations management's capital allocation intentions aren't always clearcut, even if there are no liquidity concerns. Either way, as conservative investors we prefer to invest primarily in companies with Dividend Safety Scores above 60 ("Safe" or better dividends), which helps rule out many murkier situations. As always, you can learn more about our Dividend Safety Scores and view their complete realtime track record here.